My friend Nick reaches across the cafeteria table and drops a knife into my hand. "Happy birthday, Maggie." "In seventh grade, Maggie Camden was the class outcast. Every day, the other girls tripped her, pinched her, trapped her in the bathroom, told her she would be better off dead. Four years have passed since then, and Maggie’s tormentors seem to have moved on. The ringleader of them all, Raleigh Barringer, even moved out of town. But Maggie has never stopped watching for attacks, and every laugh still sounds like it’s at her expense. The only time Maggie feels at peace is when she’s hiking up in the mountains with her best friend, Nick. Lately, though, there’s a new sort of tension between the two of them—a tension both dangerous and delicious. But how can Maggie expect anything more out of Nick when all she’s ever been told is that she’s ugly, she’s pathetic, she’s unworthy of love? And how can she ever feel safe, now that Raleigh Barringer is suddenly—terrifyingly—back in town?" 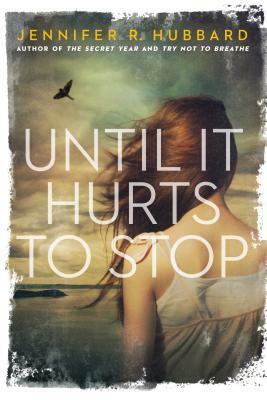 Until It Hurts to Stop is a pretty good young adult novel; it came out in September. The book is slim but powerful, boasting a quiet, small-scale story that has ramifications beyond its borders, and cuts more deeply for its smallness. I must admit that I can't really imagine people being that cruel in seventh grade, as my middle school experience was quite different. Really, is any middle school like that, with such senseless cruelty, people just lashing out at others? But that is, of course, what Until It Hurts to Stop is about - senseless, vicious cruelty, and about how to heal from it, confront the perpetrators, and break out of your shell. Despite the four years that have passed, Maggie still kind half believes the taunts that Raleigh and others flung at her - telling her that she's ugly, that no one would ever like her. It's easy to imagine how a book like Until It Hurts to Stop would stray into cliches or perhaps romanticizing things, but it doesn't. For example, on their hike to the top of a mountain, Maggie kind of starts to romanticize the woods: "Now I'm not worrying...here, with the ferns and moss, with the scabbed bark of trees, the dank smell of mud, the sweet aroma of dead leaves. Here, with the stream bubbling alongside us, soothing, gabbling in a language that I both understand and don't understand. Here, with a rattlesnake that I almost step on." That was a great and somewhat startling passage, even though it doesn't really relate to the main story. Or maybe it does, if you think about it; just when Maggie is lured into complacency and a sense of security, the girl who tortured her suddenly is once again in her path. I'm probably just over-analyzing it. I didn't love Until It Hurts to Stop, but it certainly grew even more on me as it progressed. As I said, the plot doesn't seem to boast much, but it was a really moving story not only about senseless cruelty and how to overcome it, but also about strong friendships. Obviously, the core of the story is about bullying, but the novel takes it on rather differently. I enjoyed Maggie as a character, and really empathized with her as all her old fears and worries start coming back with the return of Raleigh. Even I've never experienced outright bullying on this scale, I can certainly relate to the snide remarks of many people. That said, I didn't connect with Maggie super, super deeply, but just enough. She was also a pretty well portrayed character. The writing isn't great or anything, but it certainly is easy to get into, and very fast once you do. That's, I think, the power of first person present tense, and also its limitation. Sometimes it's too easy to just do that to draw the reader in, which is why it annoys me that so much young adult fiction is written this way. What, the authors think we can't handle past tense? Still, in this case it actually worked, and it makes the novel more relatable. As you all know if you actually read this blog, most of the time, I'm not a fan of the romance aspects of books, but in this case I liked the slow progression, although it still annoys me that from reading most YA fiction you'd think a guy and a girl could never be just friends. Anyway, it is very slow and angst-ridden and agonizing, and actually quite nice. Until It Hurts to Stop wasn't an overdone book; it wasn't long, but that was okay, because it managed to say a lot with a little. The book is a bit depressing, but the ending is really, really lovely, and it certainly left me thinking about both the characters and my own life. I would definitely recommend it if it sounds interesting; sadly, this book hasn't gotten much publicity at all (at least not in the sources I read). Disclosure: I received a review copy from the author; thank you so much!